As photo-sharing apps start to hit the mainstream — Facebook’s $1 billion Instagram acquisition perhaps the most notable — app developers, startups and entrepreneurs are increasingly forced to find new ways of tapping into the booming photo app market. 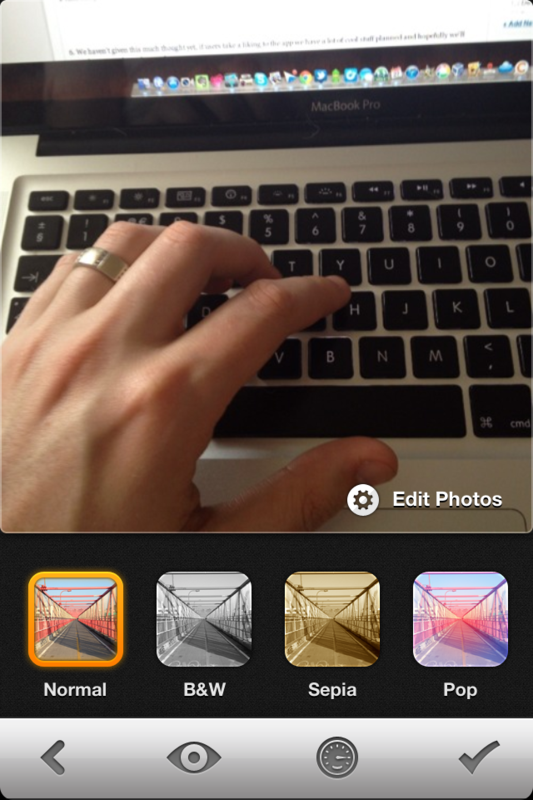 Staying true to its photo roots, Gifture is a new free app that bridges the gap between the static photo and a video, animating your photos to create really impressive shareable images that can be shared with your friends inside the Gifture network but also to Twitter and Facebook for a wider reach. 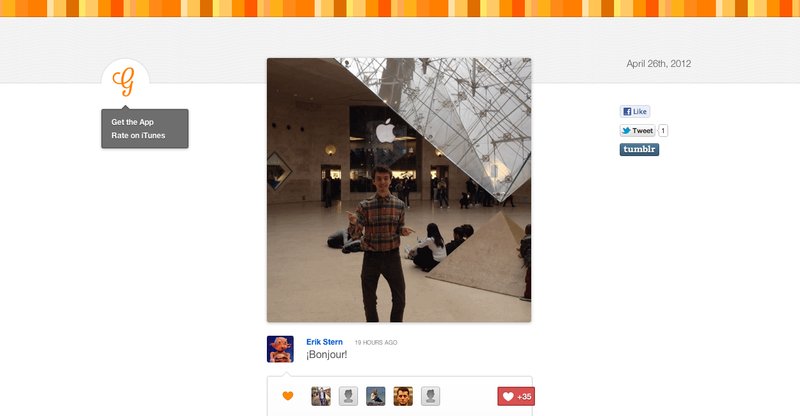 Animated GIF apps aren’t new, in fact they are seeing a bit of a boom at the moment. We’ve reviewed Cinemagram in the past, which is able to animate frames from videos with amazing results, but Gifture not only animates your photos, but also enables you to add your own images and do it using one of the most aesthetically pleasing apps we’ve had the pleasure of using. Gifture’s creator James McDonald told The Next Web that the seed of an idea for Gifture came around June 2011 when he happened to stumble upon CinemaGraphs.com. I was in awe. The GIFs on that website are absolutely stunning. I spoke with Devin (the developer) and discussed about possibly making an iPhone/iPod app and he was all ears. 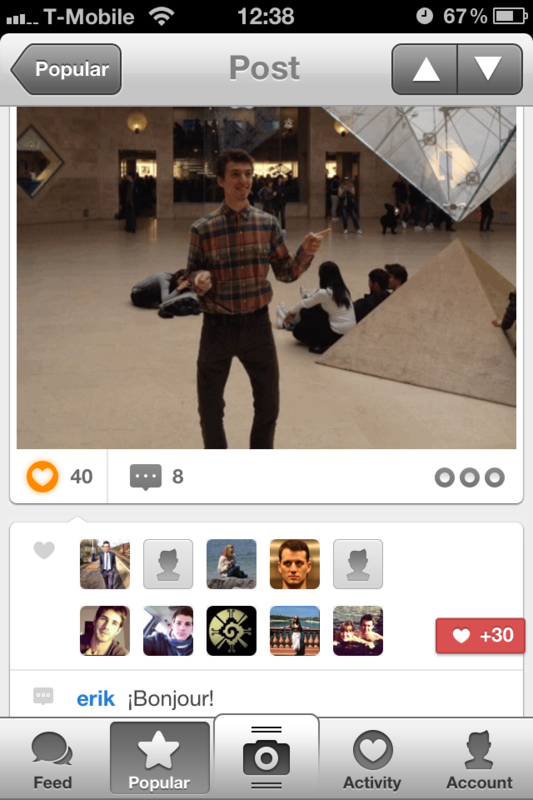 We thought we could make an app where we could have the Instagram-like base, but using GIFs instead of still photos (although Gifture does support stills as well). 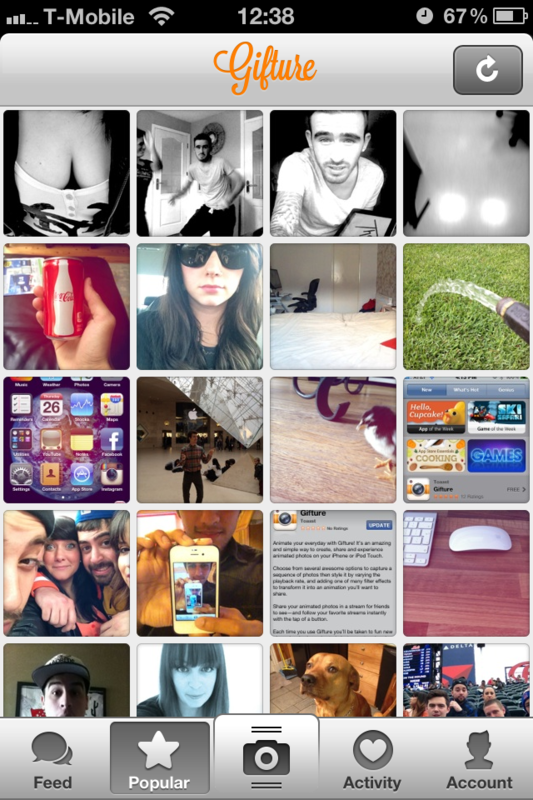 We were inspired by the basic functions of Instagram, including its feed. However we wanted to build a product that we wanted to use, something that we thought could be fun and easy to operate. Instagram is a game changer and brings out the inner photographer in everyone, in my opinion. However, we felt that with GIFs you can tell a better story over still images. They can also be absolutely hilarious, so we’re all for users to keep that trend going! 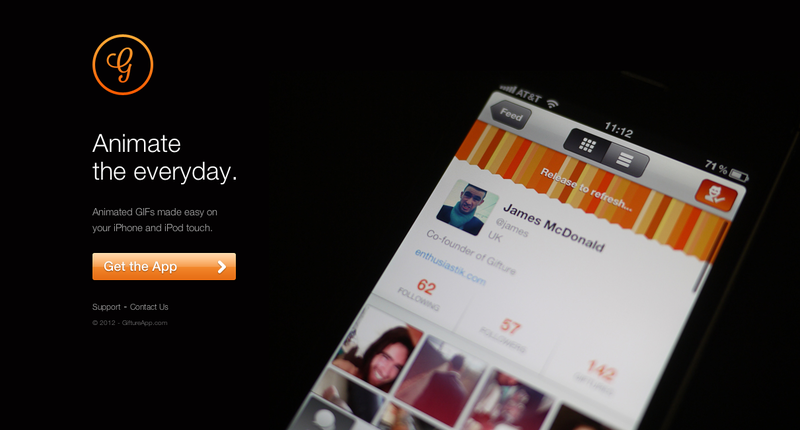 Upon downloading the app, you will be welcomed with a sign-up screen, displaying the most popular posts on Gifture. From here, you have the option to sign up to the service using either your Twitter or Facebook accounts, signing-up for and logging into the service in a matter of seconds. Similar to Instagram, Gifture offers a feed of photos, which will populate GIFs created by friends you add from within the app. The popular tab takes you back to the buzzworthy images, whilst the Activity tab shows you new follows, likes, comments and mentions of you and your friends. When it comes to using the app, it couldn’t be simpler. Hitting the photo button will load the photo app, overlaying a small grid which will show how images will be cropped to fit the 500 x 500 pixel GIF. Selecting the small ‘a’ icon on the photo screen will switch to automatic mode. This will allow you to take ten consecutive shots, making a mini video, resulting in images like the Apple Store photo above. Once you have captured your scene, Gifture provides filters — including Black & White, Sepia, Pop, False Color, Monochrome, Vibrance, or Invert — and also provides customized playback rates for each animated photo series. This means that if you want a fast GIF or a slower animation, you have complete control at all times. You also have the option of stitching photos you have already taken together. Before submission, you can share images to your Gifture stream but also Twitter and Facebook as a GIF. 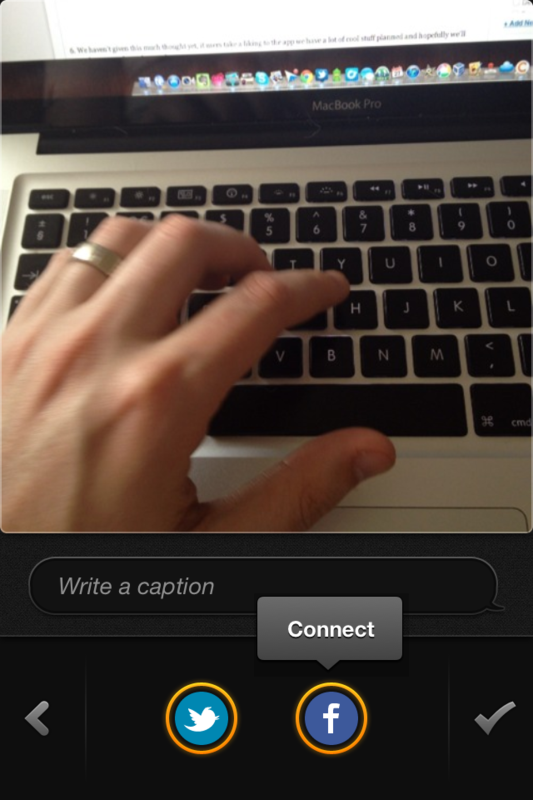 An additional context menu allows the sharing of a link to each photo in an iMessage, SMS and email. The app, the website and the resulting images are all stunning, bringing together a great user experience and what its creators hope will be the start of a thriving social network. 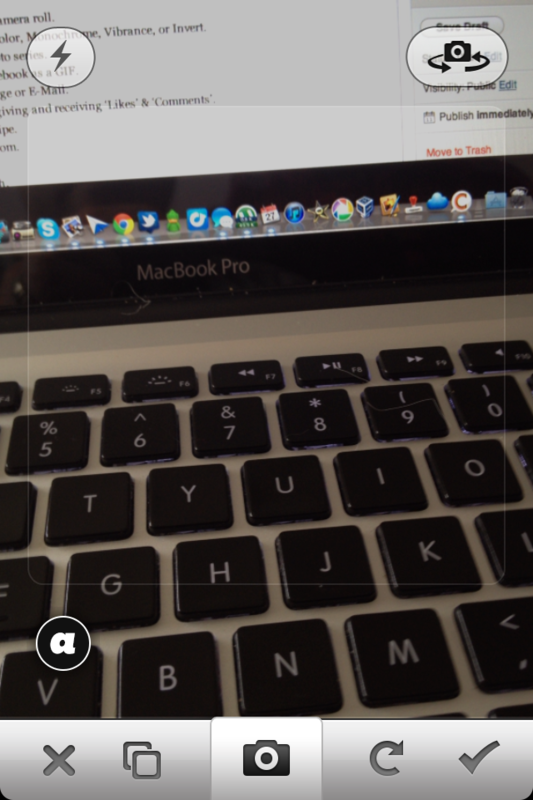 Gifture is a free to download and is available on iPhone 3GS, 4 & 4S or iPod touch.